Most steaks sold for grilling are tender, well-marbled cuts from the animal's rib and loin areas. Flank steak and skirt steak are entirely different, both in their structure and how they're prepared. Both are cuts with a distinctive grain created by long, stringy strands of tough muscle fiber. To enjoy them at their best, use a marinade to add flavor and then grill them whole. 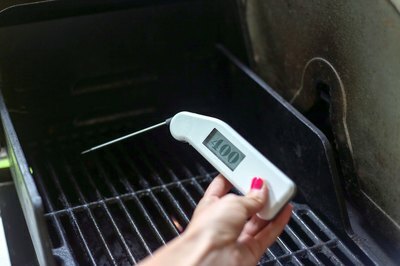 Preheat your grill to a temperature of 400 degrees Fahrenheit. If you're using charcoal, the coals will need roughly 30 minutes to arrive at the correct temperature. Remove your flank or skirt steak from the refrigerator. If it's been marinating, use fresh paper towels to blot any excess from the surface. If it's been treated with a spice rub, spray the meat with vegetable oil to protect the spices against scorching. 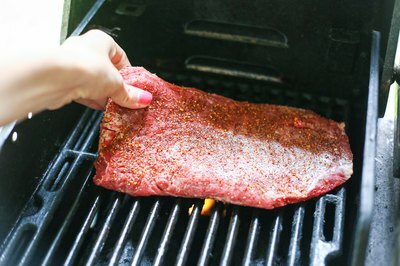 Place the flank or skirt steak on the grill. Both flank and skirt are very lean cuts, so dripping fat is unlikely to cause any flare-ups. 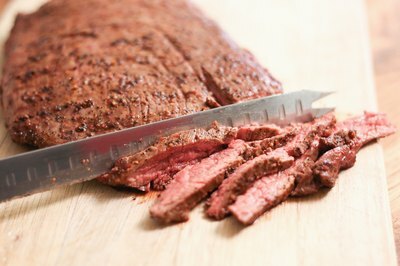 Grill a thin skirt steak for just 3 to 4 minutes per side for medium-rare, or an extra minute if you prefer it medium. Flank steak is a thicker cut and requires up to 20 minutes cooking time. Turn it every few minutes to ensure even cooking and minimize the risk of charring. 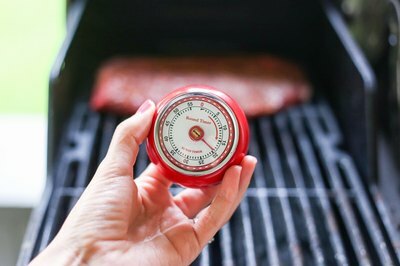 Test the steak for doneness by inserting an instant-read thermometer horizontally into the thickest portion of the meat. 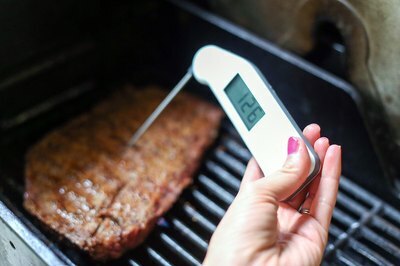 It should read 130 F in a skirt steak, which won't need to rest. The larger flank steak retains more heat, so pull it from the grill at 125 F instead. That retained heat, or "carryover cooking," will raise its temperature the remaining 5 degrees. • Skirt and flank steak are typically served medium-rare, which ensures they remain juicy and flavorful. If you cook them past medium, their already-tough fibers begin to contract, making them very chewy. • Skirt and flank are dense and tough if sliced thickly. 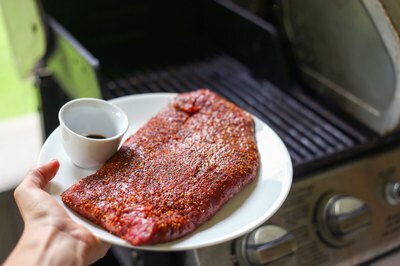 Serving them in slender 1/8-inch slices shortens their muscle fibers, leaving them tender enough to be pleasurable and letting their rich beefy flavor take center stage.